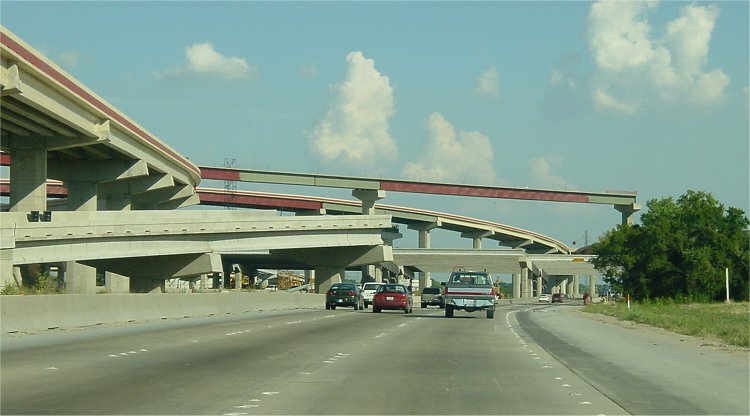 On July 31, 2001, the section of the 190/Bush Turnpike (190/GBT) from IH-35E to Midway Road was opened, providing a continuous facility from IH-35E in the west to US 78 in the east. This is the first new continuous east-west freeway crossing of north Dallas since the opening of IH-635 in 1968. So, enjoy the cruise on this impressive new facility. If you have a tolltag, you won't have to stop. (high resolution 150k) View along the southbound lanes of Interstate 35E. The ramp to 190/GBT is on the left. At the time of the photo, the IH-35E traffic was diverted to the future feeder road, which is why the ramp is on the left. (high resolution 177k) Another view of the interchange from the IH-35E southbound main lanes. (high resolution 208k) Looking east along the 190/GBT from the connection ramp at IH-35E. The 190/GBT main lane deck is wide enough for 5 lanes in each direction through the interchange. On the elevated structure just west of IH-35E, with an overhead sign still under construction. (high resolution 126k) The beginning of 190/GBT, going eastbound. (high resolution 149k) At Old Denton Road. (high resolution 106k) East of Old Denton Road. (high resolution 140k) At Kelly Road. East of Kelly road, 190/GBT curves toward the northeast. (high resolution 92k) The west toll plaza. (high resolution 111k) Approaching Midway. (high resolution 180k) Looking east from the Marsh overpass. (high resolution 111k) At Midway. (high resolution 141k) At the Dallas North Tollway. (high resolution 76k) Just east of the Dallas North Tollway. (high resolution 93k) At the Preston Road exit. (high resolution 98k) At the Coit Road exit. (high resolution 98k) Looking east from the Coit Road overpass. (high resolution 126k) Looking east from the Independence Road overpass. Another view looking east from the Independence Road overpass. The exit to US 75. 190/GBT is the top level of the 4-level stack at US 75, so no ramps are visible. (high resolution 223k) View looking south from the 190/GBT overpass, looking along US 75. In the background is the "Telecom Corridor", which was in a state of devastation as of August 2001 due to the telecom industry bust. Just east of US 75. Notice the extra pavement available on the left for future widening. In Garland, a third lane is already being added to the original 2 lanes. Continuing towards the southeast in Garland. (high resolution 111k) Approaching he current end of 190/GBT at route 78. The current end of 190/GBT as it passes underneath 78 and the railroad tracks. After going under 78, 190/GBT turns into the Northeast Parkway. This is only temporary, because the east 190/GBT should start construction around 2004.